As a casino that forms part of the Deckmedia N.V. group, Black Diamond has a strong team behind it. And this is what has undoubtedly seen it through since the year of 2009. Not only that, but it possesses a gambling licence from the jurisdiction of Curaçao, therefore everything is safe and secure. The site itself is viewable in five different languages – English, French, Italian, German and Spanish. When it comes to the actual design of the Black Diamond website, this is primarily black in colour, but provides a very sleek and slick layout. Everything is easily navigable by using the menu on the left-hand side of the screen. A small collection of developers provide their games to the Black Diamond casino, starting with Betsoft and Rival Games. Alongside these, there are offerings on hand from Pragmatic Play and Parlay Games. This means that the game lobby plays host to some impressive, high-quality titles to entertain members of the casino. There is a diverse range of these available at the casino too. 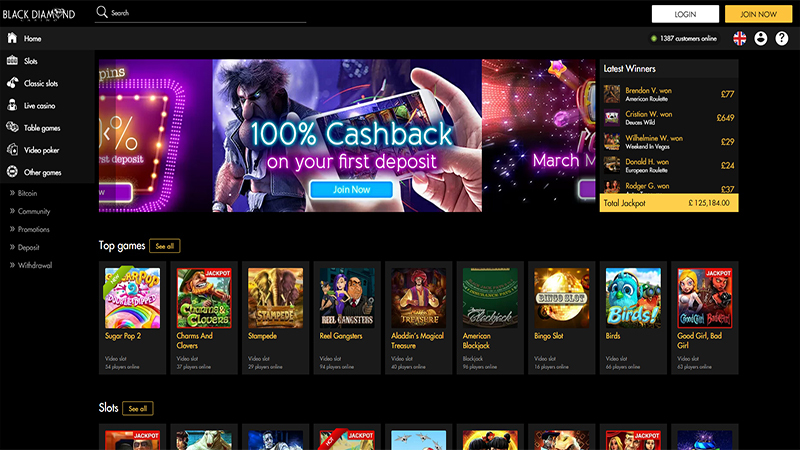 The two sections for video slots and classic slots make up the biggest selections of games that the platform is home to. Within these categories, you’ll find such titles available as New Tales of Egypt, Stampede, Fandango’s, Three Times the Riches and Royal Reels. However, it isn’t only a selection of standard slots that the casino provides. Instead, it also gives you access to some progressive jackpot options too. Therefore, you can play games like Charms and Clovers, 7 Monkeys and Tycoons Plus. If you have more of a preference for playing table games though, Black Diamond is able to cater to you too. 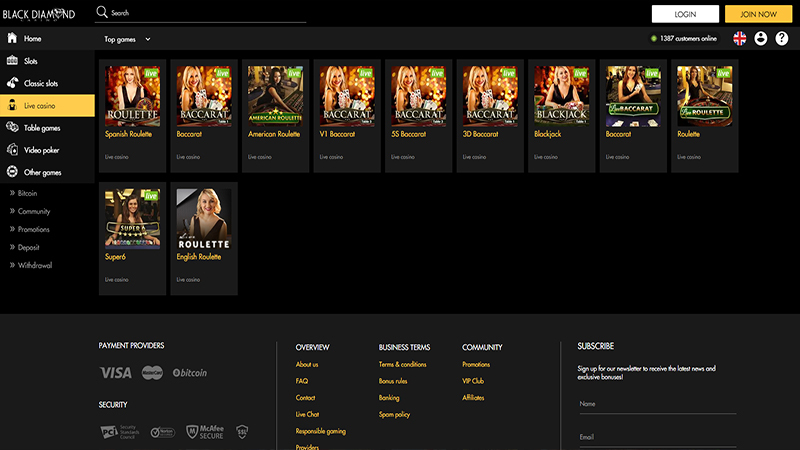 There are various versions of blackjack, roulette and poker for you to access. Meanwhile, a couple of baccarat offerings can also be found in this section. And if you have a specific desire to play video poker, these games can be found in their own category. There, you’re able to access games like All American, Deuces and Jokers and Jacks or Better. It’s not only a great choice of games that Black Diamond casino is able to provide to its players. Instead, there’s the ability to access and claim various promotions as well. As a newcomer at the casino, you have the option of receiving the welcome package. This spreads out over your first five deposits there, starting with a 200% bonus on your first deposit. The next three deposits have bonus rewards of 100% each, while the fifth comes with a 175% bonus. However, before you even receive this, Black Diamond gives you 25 freespins completely free! And if you continue playing as a regular gamer at Black Diamond casino, there are numerous rewards available for you to receive. Various weekly and daily rewards are on hand, such as the Wonderful Wednesday offer. This provides you with various different bonus amounts depending on how much you deposit on that day. Or there’s the Sunday Storm which is a tournament for you to enter at the weekend to give yourself the chance of winning up to €1,500. And among these and more, you’ll also find a VIP Club that you can become a member of at the site too. Adding money to your casino account is a process that you must go through before you can do anything else at the site. To deposit funds, you’re able to utilise a few different methods, including the often-seen Visa and MasterCard options. Bitcoin cryptocurrency is also an acceptable payment method at Black Diamond casino. Alternatively, you can make use of ecoPayz or a UPayCard as another option. When it comes to making a withdrawal though, you have three options to choose from. These are the Bank Wire Transfer, Paper Check or eCheck. If there comes a time when you need some help while playing at Black Diamond casino, then you have a few options open to you to receive such. First of all, you can browse through the casino’s FAQ section which provides some of the more common question answers. Otherwise, you need to contact the customer support team. There is a Live Chat service for this or you can send an email to them. The team is available on a 24/7 basis, so you’ll always be able to get the support that you need. Black Diamond obviously knows how to impress casino gamers, providing a sleek layout, intriguing gaming options and a round-the-clock support team. And while the payment methods available to use are a little smaller than we’d like, everything else about the casino is very appealing. Play at Black Diamond Casino. USA Players Welcome!